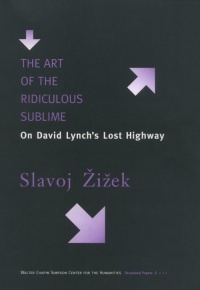 The Art of the Ridiculous Sublime is first of all the detailed reading of David Lynch's The Lost Highway, based on the premises of Lacanian psychoanalysis. Lynch's unique universe of the "ridiculous sublime" is interpreted as a simultaneous playful staging and traversing of the fundamental ideological fantasies that sustain our late capitalist society. A master of reversals, Zizek invites the reader to reexamine with him easy assumptions, received opinion, and current critical trends, as well as pose tough questions about the ways in which we understand our world and culture. He offers provocative readings of Casablanca, Schindler's List, and Life Is Beautiful in the process of examining topics as diverse-and as closely linked-as ethics, politics, and cyberspace. * Zizek, Slavoj. The Art of the Ridiculous Sublime: On David Lynch's Lost Highway (Occasional Papers (Walter Chapin Simpson Center for the Humanities), 1.). Seattle: Walter Chapin Simpson Center for the Humanities, University of Washington Press. June 2000, Paperback, 48 pages, Language: English, ISBN: 0295979259. Buy it at Amazon.com, Amazon.ca, Amazon.de, Amazon.co.uk or Amazon.fr. This page was last edited on 14 June 2007, at 18:51.